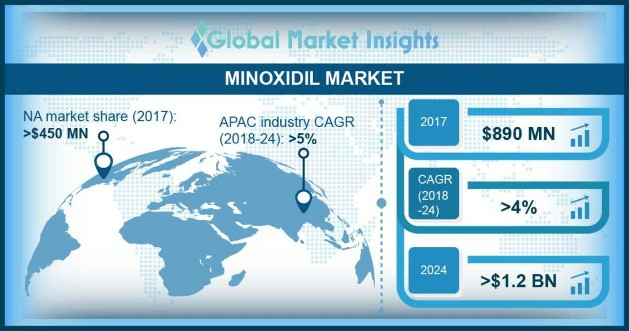 Minoxidil Market size is estimated to exceed USD 1.2 billion by 2024; according to a new research report by Global Market Insights, Inc. Rising consumer concern pertaining to receding hairlines, frequent hair loss due to changing lifestyle will drive minoxidil market growth. Busier lifestyles with increased stressed levels along with lack of protein intake will stimulate the product penetration. As per the report published by NAAF, in U.S. around 6.5 million population have alopecia areata and globally, over 147 million population or will develop alopecia areata in the coming years. Favorable laws with respect to patents and labelling of topical hair treatment products will support the minoxidil market growth over the forecast period. Additionally, excessive consumption of medications such as anti-depressants or blood thinners has resulted in higher hair fall, thereby creating new growth opportunities for the industry growth. In 2018, the World Health Organization reported that the one in every six people in China is suffering from hair loss issues for the last few years. Moreover, statistics from the China based portal JD.com reported the major selling shampoos are comprised of hair loss prevention capabilities. The use of natural oil in minoxidil products is among the key trending factor in the minoxidil market. Manufacturers are keen on producing green labelled products to have wide coverage for product positioning. However, the customers using conservative minoxidil expect similar results from the natural ingredients variant at the similar cost, which may challenge the product optimization and minoxidil price trend. The disadvantages associated with minoxidil include scalp irritation in the case of men and facial hair growth in the case of women. Common side effects, including itching & burning/redness of the eye, difficulty to breathe, tachycardia, stiffness in the chest, and unexplained weight gain may hinder its usage and can restrain the minoxidil market growth. The global minoxidil market share is highly consolidated in nature. The presence of key players, including A McNeil PPC Inc., Par Pharmaceuticals, and Dr. R. Pfleger Chemical Factory GmbH. Other prominent manufacturers are Renata Limited, Nanz MED Science, Pharma Private Limited, and Kumar Organic products. The companies develop their own supply chain network to capture a larger industry share. Competitiveness in the upstream portion of the value chain is primarily affected by factors such as the availability of skilled labor & raw material, brand, and investing upon tangible goods including equipment & machinery.